You don't have to be a clean freak to appreciate what this tool can do. 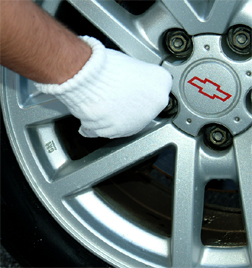 Our Microfiber Glove is an absolutely amazing product. No soap. No chemical cleaners. Wet or dry, this non-abrasive material cleans like magic! Why wax your car when you can pet it! These things are great, I originally bought a pair to polish and seal a worn set of multispoke aluminum wheels. The difference in hand fatigue between using these and trying to hold a small polishing sponge was huge. I've since started using them for waxing and cleaning around detail items that I struggled to get a rag into, vents/gills/angry car face details that are so popular on the front of new sedans. As someone who has perpetual hand pain and struggles with small applicators and details these are a game changer. ProsHand shaped, so it fits on my hands. Reduces hand fatigue. If it falls on the ground probably an early sign of leprosy because it isn't falling off my hand otherwise. Washes extremely well and in a manner similar to my microfiber towels. ConsLooks funny on my 4 fingered father-in-law. Like all products I love I now have to buy half a dozen to use for different parts of the car and with different products. ProsGreat price and can be reused over and over. Before using gloves, I would have to use a separate micro fiber towel in my other hand to not touch the paint while cleaning. These eliminate that problem and also let you get into hard to reach places. I run a special load of laundry for my micro fiber towels and throw these right in there with them. They are large enough to fit any hand and they clean up beautifully.